I am back from my trip! Whew, was it ever far..hahaha. Yes, I had to travel to Summerlin, 20 miles across town. Scrappin'escapes.com weekend retreat at the JW Marriott. Jennifer does a great job putting on a retreat. Our only regret was that she has not implemented a no ipod rule. So if someone plays their ipod everyone else has to listen to the music that one person likes. I refuse to listen to one more taylor swift song, the little idiot is all hype and can not carry a tune to save her life!! Ask any real music lover, she is out of pitch on every song!! She is all hype! Get a clue people and quit buying her cd's! And not everyone likes josh grobin, you can can only listen to so many sad songs before you want to blow someone's brains out! Sorry but I feel that strongly about having 150 women in one room talking and then having to hear a really bad sound system screeching out the same 10 songs. TWO WORDS: Ear phones! They sell them, try using them!! 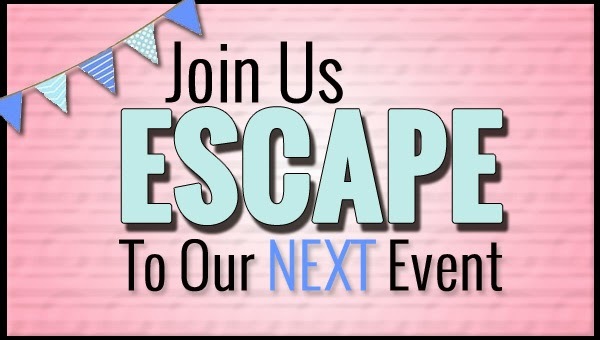 So unless she implements the NO ipod rule, our scrapping group of 6 will not be using scrappin'escapes.com for our retreats. Mary and I tried it out and feel this is a deal breaker. Although every thing else was fabulous, the location, the space, the fun. It was real nice. We will see what happens as we spoke our minds on the subject. I am heading out for my scrappin escape, Scrappin' Escapes so I hope you can manage without me for a couple days. I know it will be tough but you will muddle through it. After all there are millions of blogs to read. I just love to have my coffee in the morning and read blogs! You never know what you will come across or what interesting stuff you might learn. It is a big fascinating world out there and for the next 3 days I will be out playing in it! Have fun and I will see you on sunday! I had purchased this vintage ribbon off etsy one day, I just had to have it! I had no idea then what I would use it for. But months later, I purchased my nikon camera and the strap was just wide enough for my ribbon! I now have my own one of a kind custom camera strap! I almost bought a custom camera strap off etsy, they have some amazing camera straps that people make, just go to etsy and search "camera strap" but I love my monkey strap now! Have you made anything fun lately? Give it a go, it will make you happy! I love las vegas we all know that. One of my favorite things to do is go visit the strip, my husband knows this and humors me by driving down the strip every once in awhile. I love to roll down the window and watch all the tourists, I love the hotels and the lights and signs, the music you hear as you drive slowly by, people drinking and laughing and having fun. Nothing gets you more happy as driving along the strip. Last night Charlie took me for a drive and we ended up cruising the strip, then he says the magic words, the ones that made me fall in love with him, " Where would you like to go to dinner?" Oh, Yes!!!! 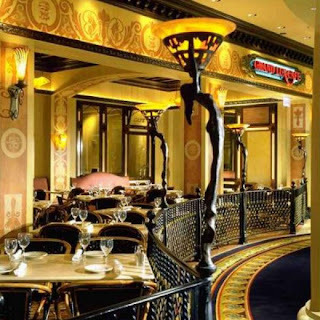 I chose The Grand Lux cafe, at first we couldn't remember which hotel it was in, I knew it was a fancy one, so I said Bellagio. Wrong, then we asked, and they said Palazzo, but even though they have a Grand Lux there, that is not the one, The one I love is in The Venitian! So make sure you go to the Venetian Grand Lux cafe and eat, get a patio (inside) table. You can sit and watch the tourists come and go, and watch the women try to walk around in 8 inch heels, and you will usually see 1 or 2 brides go by in their wedding dresses, we saw 3 last night! The food is spectacular, I had a small combo of sirloin and shrimp scampi, the portion is the small version so it is just the right amount of food! Charlie had chicken alfredo. What a fun night out, I love Las Vegas! My used but new to me REAL camera!! 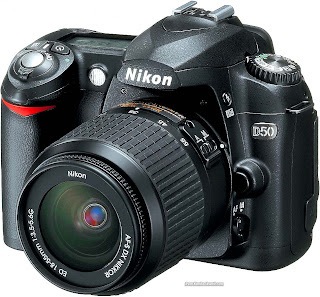 Nikon d50 slr...I read all the reviews and this is a great beginner digital slr. I got it used off ebay and I am taking down for a checkup at the camera shop today. I read 1/4 of the 148 page manual and I learned so much already! I took my first photo of the yucky weather we had yesterday, today is no better but I have to brave the cold and get a camera bag and and a battery charger as it did not come with one, but the price was great. This camera still sells for about 500.00 and I got it for 300.00!! I am going to try to learn as much as possible before my alaska cruise and Travis's wedding!! I need to check on beginner slr classes at the camera store! Stay tuned for some awesome photos on my blog, taken finally by me, I can quit kyping photos off the internet! just a quick note about my blogs...I have made new headers to reflect each blogs personality, hope you like them! My regular blog, my cooking blog and my etsy store all sport new headers! My etsy store header actually has photo of jewelry I made in the header, Jerry B owns that piece of jewelry now, She is my peace loving friend! I am adding new recipes to the cooking blog, one in a few minutes. Yesterday it rained so I decided to make a cobbler. I had a bag of frozen cherries in the freezer, so I grabbed a peach cobbler recipe off tasty kitchen site and made a cherry cobbler. I love to bake in the rain! My friend Myler was over and I made her eat some, she said it was very good! Ok, off to get some real work done! Yesterday I went antiquing with some friends to boulder city...I bought a little lemur for my terrarium and a crystal type rock...looks good! Also update on my amaryllis...ok what do I do with it now??? I received an amaryllis plant from Ferne for Christmas, it was only about 2 inches big, now it is almost 3 feet!! I can't believe it is still alive! It is getting ready to bloom! My sister is great with plants, anything that is alive she can keep alive, not me, I missed out on that gene, she is a Registered Veterinary Technician and saves animals lives every day. Our house was filled with plants growing up and animals, they thrived, all because of Christy. My thumb is black. I am lucky my son survived toddlerhood. Well, she helped with that as well, he almost choked to death on a dorito, I froze like a deer in the headlights but not Christy she turned him upside down and wacked him on his back, he lived another day! Today I decided since I was doing so well with the amaryllis plant that I would try a terrarium, I saw nora griffin of www.noragriffin.typepad.com get one for christmas and I thought, that is perfect for me, terrarium's are great, no maintenance, just a spritz of water every couple months, it is it's own eco system so they are self sustaining. Works for me! I went to lowe's and bought the supplies 23.00 later my terrarium is all done! Let's see if it can survive. Place your bets folks, place your bets! Go out and make something fun tomorrow, you'll be glad you did! I am! Neil Young Guitar: I have spent the weekend making more guitars and getting them put in my Etsy shop. Hope you like them, I have so much fun making them and naming them!! I love Neil Young's "Like a Hurricane", the guitar has swirls like an actual hurricane happening! Then you have a purple guitar that has lines that look like rain, so that is, of course, Prince's purple rain guitar! Plenty more in the store, go check them out! I am going to be listing more items in etsy and ebay, I have my sons wedding and a cruise to raise funds for so please support your starving artists! www.peaceloveandartshop.com Thank you so much! 2010 Hope it's a good one! I have lots of fun stuff planned for this year so I hope business hangs in there, we need a couple more accounts to keep us sailing smoothly! Luckily we got most of this years trips booked and paid for!! Plan ahead folks, plan ahead!! The end of this month will find Charlie racing at Irwindale and my friend Mary is coming to visit for the weekend, we will do some scrapbooking with a new group called Scrappin' escapes www.scrappin-escapes.com we are going to try it out to see if they can replace Croppin'away www.croppinaway.com We are not sure if Carolyn is going to be continuing her fabulous crops but we need to go somewhere until she decides what she is doing! We miss her crops! February I will be going to Art and Soul www.artandsoulretreat.com for the first time, my sister Christy is coming out to join me and I get to stay at the Paris hotel, they have a great buffet there and I have never stayed at the Paris, you do know I am trying to stay at every hotel on the strip, it is on my bucket list!! More highlights this year will be my Alaska cruise in August and Travis' wedding in October! So stay tuned for more fun from Las Vegas! Oh and check my cooking blog, I have been cooking lots of new stuff and there is plenty more to be made as we are trying to cut back on restaurant bills!